We like the Canon Pixma ip1300 printer because first of all it’s very easy to connect to your computer! You can plug in the cable, turn it on, locate the name of the printer in the setup section and you’re ready to go! That is Canon keeping it simple! The Canon Pixma ip1300 ink cartridges are available as both original and compatible ink cartridges. The standard ink cartridges for the Canon ip1300 are the Canon PG 40 black ink and this original manufactured cartridge will hold 16ml of black ink. The colour cartridge is the original canon CL 41 ink cartridge and this has a volume of 12ml. Both of these ink cartridges come in the XL range, i.e. the high capacity versions; Canon PG40XL and Canon CL 41XL. We tend to favour the better value for money compatible or remanufactured ink cartridges; the black compatible Canon PG 40 has 26ml of black ink inside which is almost 50% more than the original! The remanufactured Canon CL 41 colour ink cartridge has 24ml of colour ink inside and that’s almost 100% more than the original ink cartridge!. We particularly like the basic design of this printer which is very easy to learn to use. The printer is gray in colour and that helps make it look professional, neat and clean even if we don’t clean it that often! The section that holds the paper is very well designed because it doesn’t accumulate dirt and therefore we don’t need to use a cover to keep out the dust. Also, the simplicity in which you can change the ink cartridge is very useful. The remanufactured or compatible PG 40 ink cartridge goes to the ink station automatically when you open the cover change or refill it. There are two locations for the ink where you can insert the black and colour ink. 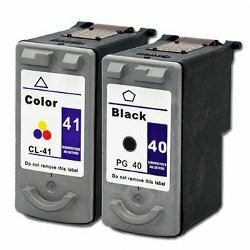 The space for the remanufactured or compatible Canon CL 41 ink cartridge is marked by the letter C and the space for the remanufactured or compatible Canon CL 41 ink cartridge is marked by the letter C. This really makes it easy for the user change the ink cartridge with the minimum of effort. There is a set of twin buttons located on the printer which are very easy to understand. The first button is a simple on off switch and the second is the button to correct any errors there may be with paper feed etc. There are also two light buttons that will blink if the printer is out of paper. The printer is quite big in terms of width and therefore will take up more space on a table. Another negative side to the printer is there is not paper collection feature so you need to leave plenty of room at the bottom of the printer to allow for the paper to fall out.